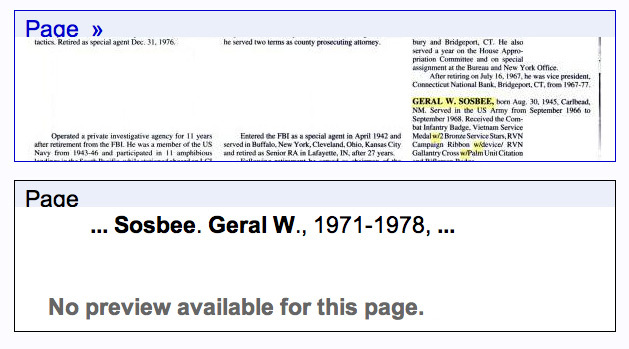 Note that as of August 5, 2009 the publisher of the fbi history book in 1996, now in apparent association with the fbi assassins remove from public display the page number 211 (page 230 on the former internet display) where Sosbee (and nine others) are featured. 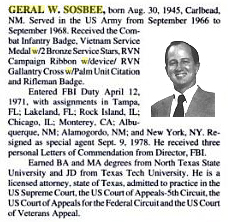 Additional information about Mr. Sosbee: He was born in Carlsbad, NM in 1945. In 1966 he heard the call of his country and joined the US Army. While in the army he received a number of commendations, including the Combat Infantryman Badge, RVN Campaign Ribbon w/device, Vietnam Service Medal w/2 Bronze Service Stars, RVN Gallantry Cross w/Palm Unit Citation and Rifleman Badge. After leaving the Army in 1968 his next commitment to his country was to join the FBI on April 12, 1971. With many assignments including: Rock Island, IL; Tampa, FL; Lakeland, FL; Monterey, CA; Alamogordo, NM; Chicago, IL; Albuquerque, NM; and New York, NY. 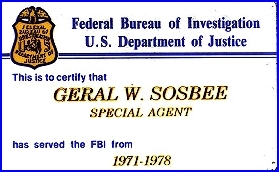 His work was so outstanding that the Director of the FBI awarded Mr. Sosbee three Letters of Commendation. He received a BA and MA from North Texas State University and from Texas Tech University he earned his JD. 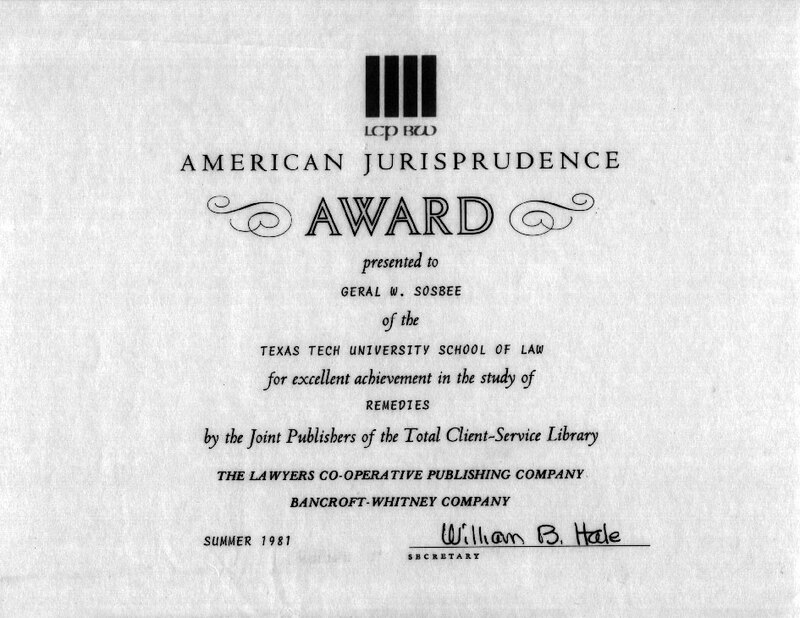 Shortly thereafter he became a licensed attorney in the State of Texas. Admitted to practice law in the United States District Court, Western District of Texas, El Paso, Texas, on August 3, 1984. Sosbee is also admitted to practice in the US Court of Appeals, 5th Circuit , the US Supreme Court, the US Court of Appeals for the Federal Circuit and the US Court of Veterans Appeal. Today, July 26, 2001, he continues his efforts to show the American people the extent of fbi fraud and corruption and the willingness of the courts and the con gress to allow the fbi's continuing treachery and malfeasance. The result of such awful depravity which is today's fbi is the collapse of world respect for our country because the fbi and cia thugs and assassins set the standards for United States foreign and domestic public policy through a variety of terrorist plots and subversions. This is the full text image from History Book. This is the link to the book review. 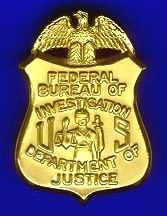 This book contains some biographical information on Geral W. Sosbee, and in the context of www.sosbeevfbi.com the fbi history book also serves as foundation for 1)establishing the bona fides of Sosbee (one of the few living former agents featured in the book)as a credible fbi whistleblower and 2)understanding the perceived need for the fbi to discredit, torture and ultimately kill Sosbee who is currently a Target of fbi/cia goon squads for reporting the widespread criminal activities and macabre culture of the fbi/cia.